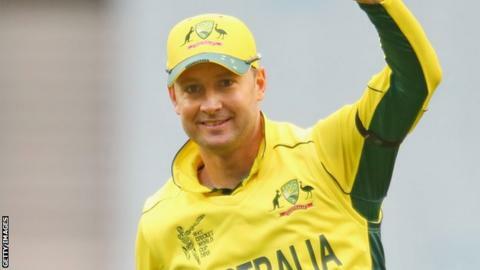 Australia captain Michael Clarke will return from injury in Saturday's World Cup match against Bangladesh. Clarke had surgery on his hamstring less than two months ago and was set a deadline of this weekend if he was to take any part in the World Cup. He has come through two warm-up matches, scoring 98 runs, and coach Darren Lehman confirmed the news. Clarke 33, will replace George Bailey, who led Australia to victory over England last week. He suffered two injuries to his left hamstring in 2014 before tearing his right hamstring while fielding in the first Test against India on 13 December. He even went so far as to suggest that the injury may have ended his career. But, by 24 December, he stated his desire to be fit for the World Cup and returned to action in grade cricket on 31 January.